It is an unfortunate fact, that in some situations, for development to proceed trees and hedgerows have to be removed. 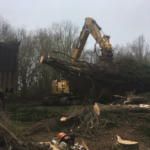 Wherever possible mechanical felling and handling is the safest and fastest option to both small and large scale tree removal operations. 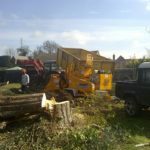 Small trees can be removed in one piece and larger trees dismantled by tree shears, before processing by chipper or mulcher, or where timber is contaminated a slow speed shredder. After the tree has been removed stumps are either processed in situ with a stump grinder, or excavated and processed by mulcher or shredder. 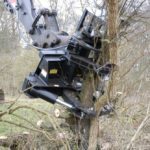 In situations when mechanical felling cannot be employed, our team of nptc qualified and experienced arborists can safely remove any number or size of trees with minimal delays. All TPO, conservation area and felling licence applications are dealt with prior to commencement of works along with any ecological constraints that may be applicable.